replace the cover, then lower it and replace the luggage compartment carpet. 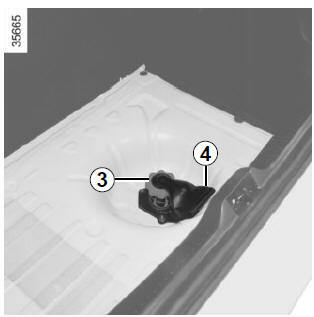 NB: if the tool kit does not lock in place, check the tightness of nut 3 and the correct positioning of handle 4. The emergency spare wheel holder should always be present when you are driving even when the wheel itself is not present: risk of water entering the vehicle. If you have to release it when it is not holding a wheel, push the centre of the wheel holder towards the ground while pressing handle 4. It is essential to lock the nut so that the wheel is held securely. The system should only be used with the original vehicle wheels or identical wheels.